The condo was very nice. Very spacious and very nice furnishings. The balcony it was very spacious with a table for six. It overlooks the marina which was a very pretty view. But and this is a big but you have lots of traffic noise from the road which is hard to not hear. That is the only downfall of this end unit condo. The room was very spacious and clean. Relaxing atmosphere, loved the dock view. The dishwasher and washer were loud and needed some repairs. We arrived in the late evening for a three-day stay and had no problem with the after-hours process for obtaining keys to the condo, #3040. The unit was clean and had a wonderful view of the harbor from the large balcony, which is accessible from both the living room and master bedroom. All appliances worked, although the microwave failed on the last morning just prior to checkout, which we reported to management. Although the bathrooms were clean, they clearly showed their age. The lighting and fixtures are very dated and, in my opinion, both bathrooms need to be renovated. That is the only detraction I observed from an otherwise wonderful stay. Spacious comfortable rooms with a great view of city docks. Great place to stay , the property was clean and quiet and we really enjoyed our stay! Great view of the marina form the balcony! We will definitely consider coming back! The property and condo were as described. Everything was in working order. The location is perfect for us for fishing and lobstering. Convenient boat dockage. The property management could be seen daily working hard to keep the place clean. The office manager was friendly and helpful. Duval is a short ride for nightlife, shopping, restaurants and bars. It was a great stay. Bathroom and showers in need of repair. Bathroom drop down ceilings coming apart and moldy. Shower heads not functional. Holes in ceilings and walls - washer and dryer need replacement. Location is great - convenience is great. Will still return. Had a great time. The property manager is amazing and very helpful as well as her staff. 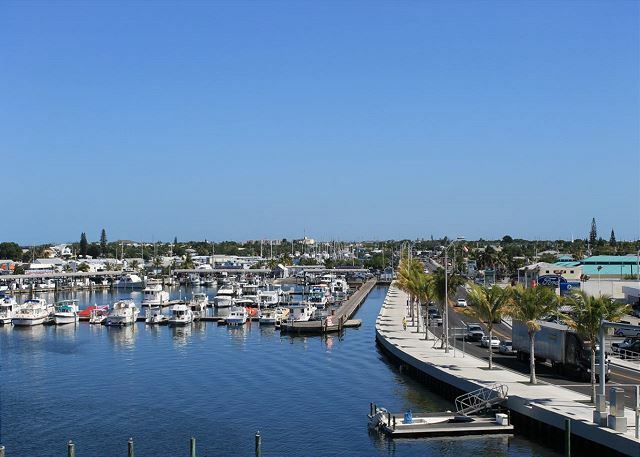 The property is very clean, spacious comfortable clean rooms as well as the convenience of having the boat slip right behind you is priceless; especially in Key West. Not to mention your own assigned parking lot for cars or golf cart. Great great place to stay and our new place to stay in Key West. We loved having a balcony overlooking the marina. We saw manatee, tarpon and just enjoyed watching all the boating activity. The rental was very nice, well supplied and clean. The only concern was the WiFi. You get bumped off constantly. It was a great experience from beginning until the end. We chose Pelican Landing online because because of the setting and overall value. Pelican Landing staff were top shelf with their communications. They were caring about what we were looking for. They also gave us a list of things to do, locations, and costs. in the Key West area. They were very professional, friendly, and answered questions quickly. We enjoyed the covered deck overlooking the marina, and all the amenities it provided with easy access to the city. 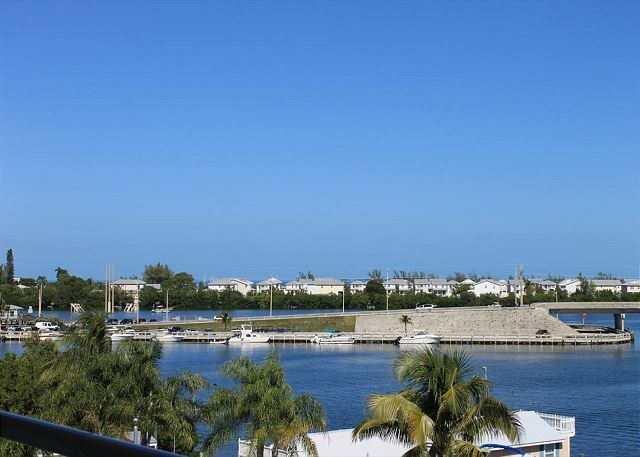 We highly recommend this property to anyone looking for a place in Key West! We really enjoyed our 3 days there! The space was great for a family of four adults, and the location worked fine for a car-free vacation. The two major downsides were the loud noises from the guests upstairs. It sounded as if they were rearranging the furniture all night long. The other problem was the intermittent wi-fi. It would show as connected, then drop off, over and over. Office staffing varied daily but everyone was super friendly and helpful. Sandy's Cafe close by for great cuban sandwiches. Blue Heaven for ping pong before a delicious dinner. Fausto's Food Palace for a close by convenient grocery. We were very pleased with our Condo. It was very clean and well furnished. Beautiful view from our balcony. The management was great, very helpful. We were happy with our stay at Pelican Landing. The property was nice and the location was convenient for us. Loved it! Always do! The fact that we can have the best of both worlds with our boat and a key West in our backyard is amazing! Great vacation! Location for fishing and diving can't be beat! Close to shopping, restaurants, and Duval. Condo has all the basic amenities for a comfortable stay. great place to stay & fish all the way around! could not have had a better experience, great people! Awesome place! will be back very soon! Took a fishing trip with my dad and eight year old son and the rental was perfect. Great having two bedrooms and space. Great location...Close to everything. Will be back. Great time with great friends in Key West. Great location. Our 10th year in a row here! Best boat dockage; we can see our boat from our condo porch. Condo and property clean & maintained. Close proximity to shopping, restaurants and Duval. Attentive & pleasant management. Great place to stay, very close to downtown and adjoining islands to the north. Good central location. Next to charter boat row. Place is well kept and staff and residents friendly. From start to finish a great experience. The rental company was nice, attentive and a pleasure to work with. We loved the location ~ within a mile or so to most everything. About 1 or little more to Duval Street ~ easy bike ride or 20/25 walk. LARGE condo! Perfect for my family of 6 with room to spare! Very clean! They do provide pool towels too! Although they did state it in the description about limited kitchen supplies ~ I do feel they they could invest in a few more things (i.e. hot pads) and it would be perfect. One other thing to note is that you are next to the police station ~ you will hear sirens, but it did not bother us and I would stay again. We had a lovely experience.Condo was very spacious and in a great location. Staff was very friendly and helpful! Would definitely stay here again! Easy Check in, very clean and spacious room. Best place to stay for fishing & lobstering! Easy access to Gulf & Atlantic. Great dockage. Centrally located for groceries, restaurants, and bars. 5 min drive to Duval. Great vacay! Overall we had a great weekend in Key West. I was traveling with my wife and 3 kids and we stayed for 4 nights. Our unit was "The Florida", third floor end unit, 2 bed, 2 bath, tile throughout. The unit was roomy, very clean and decorated nicely. The dock was perfect for our 32 Contender, fish cleaning station was well organized and spacious, Ice machine is large, and the pool and tiki bar were great. A. The Fire Station is directly across the street from the master bedroom sliders. Seemed like there must be a high number of calls in Key West because they were lighting up their sirens all night long. B. Pelican Landing was advertised as a family friendly, couples get away, quiet, non-partying destination. We had a large group of young ladies above us that came in every night around 4 O'clock in the morning from long nights out and drug chairs across the floor and made all kinds of noise. Seemed like we were up there with them it was so loud. This was a very nice, clean place. close to old Key west and new Key west. Very home like filling and we loved having a full kitchen. I would live to stay at this location again. Had a beautiful view of the harbor. Spacious condo. Parking was convenient. Pretty good location. Nice neighborhood to walk. A ways to major sights but ok. Beds were fair. Great deck. Woulda stay there again. Good place just a bit loud. We stayed here for a long weekend in February 2015. We were very happy with the rental. The property was clean and well maintained. It is a long walk to many of the destinations on Key West, but only a short Taxi ride. Check in and check out were easy. I would definitely stay here again. The condo was just as it was described. We had a great stay and would recommend to friends. We had a great stay. Everything was clean, people were friendly. I wasn't sure what I was getting into when I booked but I am glad we went with Pelican Landing. We absolutely love this incredibly roomy..kitchen, laundry, large bedrooms, large roomy balcony that overlooks Garrison Bight. It is perfect for large families or couples. Great annual family vacation and boat dockage. Lobstering, fishing, and colorful sunsets. Superb location for us as we were fishing and the marina is close by. The apartments are excellent with everything one may need. whilst this was our first stay our colleagues have stayed at the same location for many years and have always had the same excellent service. All good and as advertised. The unit was very nice..even better than in is an end unit and very spacious. Needs more silverware but really everything worked well and we were very pleased..The location for the fishing charters are right in view (which was so nice over the harbor) but key west attractions are a long walk ...almost 2 mi to Mallory square...or a cab ride..which our group did both...cabs can be difficult to get at times.. 5/6's the best.We had a great time..unit great..but take in consideration the distance to activities. Btw management does rent bicycles! Stayed at Pelican Landing in a group of 8. The interiors were all nice and comfortable with clean bathrooms and kitchen. Beds were comfortable and sheets were clean, sofabed was the general uncomfortable kinda. There was ample parking, and the view was nice from the room. The staff was great and helpful too. Convenient location to everything. Reported no hot water in shower first day which was immediately remedied. Saw property maintenance / cleaning staff busy everyday. Great dockage / ice access. Enjoyed the rental. Cleanup every three days did not happen. Didn't bother us. 1st night stay was in the Antigua suite excellent plus. The second night in the Florida suite, very disappointing, as this unit was poorly maintained. The mattress in the master bedroom needed replacing, dishes in the kitchen lacking cereal bowls, no sink stopper, overall needed all new furniture, but the unit was very clean. Alexandria on the front desk did an excellent job. suites are beautiful. rooms are gross. 6 of us ladies had 2 'rooms'night 1 that weren't that nice. Nights 2 and 3 we asked to be moved to the 'retreat' next door which was lovely!! Lady in the office was SOOOO nice!! This is the second time I've stayed with my group at Pelican Landing and it was just as great as last time. This year I was in charge of booking and all arrangements, the staff was amazing at answering all my questions and working with not only our reservation, but coordinating with the IWFFA tournament we were in town for. The suite was exactly how it appeared in the photos - large and clean. The appliances were up-to-date and in general we were very happy. The only negative thing I can really say is that there was something wrong with the pull-out bed in the living room. The location was a bit further from the action that I would have liked, but taxi service was very prompt and for the price, you can't go wrong. We enjoyed Pelican Landing! Definitely would stay there again and recommend to others. Great balconies in the Retreats. Worked great for family to stay here and go diving before the Ragnar and then to have friends join us in the neighboring condo for post race celebration. Only confusion was late check-in instruction on using the "EL" to get to our room. The "EL" stands for "EL" key needed to access the elevator. 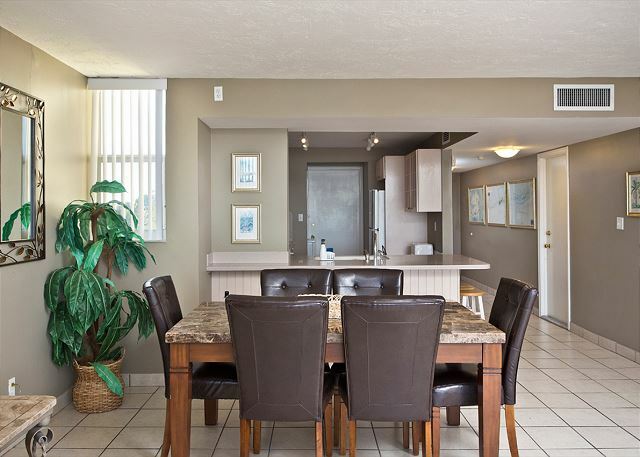 Very nice condo unit with minimal concerns and very good overall experience. The rental experience was great. The suite was clean, roomy and had everything we needed. It was about a 10 minute walk to duvall st. but wasn't too bad for the price you pay for the suite. Overall I recommend Pelican Landing. Hello Joshua, Glad you enjoyed your stay! First thing you notice is the size of the place it's a full 2/2 apartment, nothing like renting a hotel. if you're into doing your own thing, this is for you. We were pretty much left to our own devices. This place was fantastic. 6 of us stayed here for a bachelorette party. The best part is floor to ceiling, wall to wall glass in the living room and master bedroom with sliding doors opening on to a balcony that ran the length of both rooms and overlooked water. There are two tables with a total of six chairs out on the balcony. The kitchen bar has enough stools around it so that everyone sat there for breakfast each day. The location is about a mile from Duval. If you take a taxi be sure and ask for one that gives normal rates of per mile. It only cost $6.50 to downtown with that type of taxi, another taxi service charged us $4 per person. The weather wasn't the best when we stayed, but we still had a great time, in part due to the awesome place we were staying. I highly recommend Pelican Landing and will definitely stay here again if I'm ever back in Key West. Had a great time...looking forward to coming back next year! Rented the resort option which included boat slip but we did not use it this time. Rooms large and fully equipped with everything you need for daily living. When we made the reservations we were told that the two rooms had two double beds. Actually one had double beds the other a queen. The sofabed was broken and one of us had to sleep on the couch. That would have been a problem if it had been a couple. We rented the Florida Retreat, it was Amazing. The condo was great it felt like home, the bedrooms were big, the living room and kitchen were large and comfortable. The views from the balcony were great. The only problem was I didn't have a boat to use one of the slips and that's my fault. We'll definitely be back. Fish carcass odor improved, but still a problem. Overall, a great stay! Was a little upset that the ice machine was broken, that could have saved us ALOT of money. Some of the other people staying there were a little reckless but we had an overall great time. Thank you! With proximity to fishing charters and for a boys fishing weekend, the location was very good. 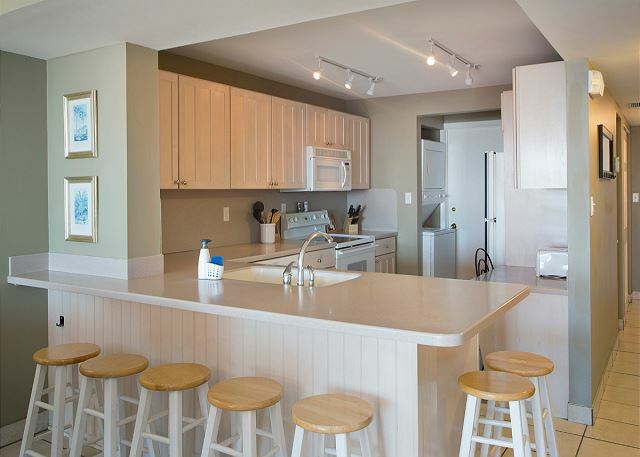 Easy access to ocean from boat docks and the balcony and 2 bedroom unit were spacious and clean. Lengthy walk or $10 cab ride to Duval but did not need a rental car to be able to enjoy Key West. Bike rentals and scooters close by. We arrived late at night and their system to leave the key in the lock box was perfect. The apartment was awesome - perfect for our needs. Thanks for a fabulous stay - we'll be back! Great location w. a nice view for our mini vacation. Courtney, property manager, was very helpful with our requests & concerns. The a/c filter needed changing, TV remote was missing, kitchen floor dirty & in need of mopping plus d/washer was clogged. All these items were addressed immediately upon our mentioning to Courtney. Once these items were corrected our stay was great, including morning coffee on the balcony. Would definitely return.